On Monday 15 February 1971, Britain went decimal. The old money, pounds, shillings and pence, was replaced by a new system with 100 pence in the pound and no shillings. It seems simple to us, but at the time people worried about it. Imagine the confusion though, if we were to go the other way around. For a while the old and the new currencies ran hand in hand. People paid in pounds, shillings and pence and got change in new pence. The original plan was to keep the old money in circulation for eighteen months. In the end, the old penny, halfpenny and threepenny bits were no longer legal tender after August 1971. How did people cope with two money systems at the same time? On D-Day (Decimal Day), 15 February 1971, people already had the new 5p, 10p and 50p in their change. They also had the old penny, threepenny bit, sixpence, one shilling and two shilling coins. The halfpenny, half crown and ten shilling note was already withdrawn. Some shops were ready to take decimal money, others were not and had prices in £sd. So how did shopkeepers and customers work it out? The sixpence was the bridge between the old and the new currencies. It was the smallest unit of old pence that converted to new pence without fractions of less than half a new penny. Sixpence was 2½p, but threepence, for example, was 1¼p and there was no coin for ¼p. To buy in a decimal shop, you divided your £sd coins into six penny (6d) units and rounded the price up to nearest sixpence. The shopkeeper gave you the right change in decimal coins. To buy in an £sd shop with decimal money, you rounded up to units of 2½p and the shopkeeper gave you £sd change. 1. Convert 11p to units of 2½p. 11p = 2½p x 4, but we still need to pay another 1p. So we convert it to 5 units of 2½p. 2. Convert to £sd coins. 5 x 2½p = 6d x 5 = 30d. 30d is two shillings (2 x 12d) + 6d or 2s 6d. 3. Pay the shopkeeper 2s 6d. He translates it to 12½p. She gives you change in decimal. So she gives you 1½p (12½p minus 11p) in change. To buy ½lb Stork margarine costing 1s 3d. 1. Round up to the nearest 6d. 1s 3d rounded up to the nearest 6d is 1s 6d. 2. 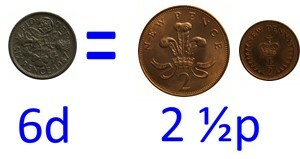 Convert the 6d units to 2½p as you only have decimal coins. 1s 6d = 5p (1s) + 2½p (6d) = 7½p. 4. The shop keeper treats this as 1s 6d and the price was 1s 3d. So, gives you 3d in change. This transition period only lasted until 31 August 1971. Although for one retailer it was to last signifcantly longer. What about bank accounts and cheques? The banks closed on Wednesday 10 February 1971 and did not open again until Monday 15 February. In this time they converted all bank accounts to decimal. They used the Banking and Accouting table to do the conversion. It used approximation to do a fair conversion. Bank accounts had no halfpennies, although there was a decimal halfpenny in 1971. Cheques were not £sd or decimal until the customer filled them in. So there was no need to issue new cheque books. People had to write cheques dated before 15 February 1971 in £sd. On or after 15 February they had to write amounts in decimal. People still paid old bills in £sd with decimal cheques. They used the Banking and Accounting table to do the conversion. Rising prices was the biggest controversy with decimal currency. People thought the shops used it as an excuse to put up prices. This may have been true, as many changed their prices when the new money came in. But inflation was high in the 1970s and prices would have risen anyway. There was a remarkable evolution in design from the old money coins first minted in 1953 (see old money). Although they depict similar motifs, there is a much more contemporary feel to them. "New Pence" and "New Penny" have now gone - to call anything from 1971 "new" is stretching it a bit! Promises to Pay, the first three hundred years of Bank of England Notes, by Derrick Byatt, published 1994, Spink. Page 186.